I was at this show with a girl who was breaking up with me. A very sad time in my life... thought she was the one. Anyway, I remember thinking (as we were both HUGH fans of Joni Mitchell) taking Regina to this show might turn things around for me. When we came out it had been snowing! Manhattan, so quiet, so white, so romantic... "down along the Hudson, past the shipyards in the cold". I was there with my brother. We had a box over the stage. It ws great. I was madly in love with Joni back then and it was wonderful seeing her live. One funny note was a friend of my brother's was desperate to get into the concert but she had no ticket. While looking around for a scalper, she found a trailer, which was where they were recording the concert. She ended up listening to it with Neil Young! I saw this show at Carnegie Hall with two close friends when I was a senior in high school. Carnegie Hall was the perfect venue for Joni - it was lush and intimate and had incredible acoustics that really showcased the purity of her voice. She had a wonderful rapport with the audience, and we were simply enthralled! When the show ended, we walked right up to the stage and handed her a rose we had brought with us. I guess security wasn't so tight in those days... 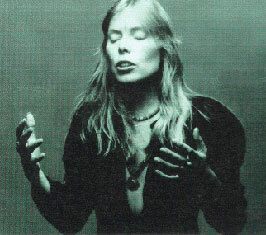 Many years later, my high school-aged daughter told me she thought I'd like this great artist she had discovered named Joni Mitchell. I still laugh at the expression on her face when I pulled out all my old vinyls of every single album Joni had recorded! I was at this show. One of the most special nights of my life. At the show, Joni announced that the performance was going to be her next album. Alas, the performance was never released. I have no idea why as my memories are that it was a wonderful show and the sound was superb. After the show, I was waiting for a ride from my father who was in Applause on Broadway, and Joni came out to get into the waiting limousine and gave me and a friend a huge bouquet of flowers that someone had given her. I kept one of the flowers for years although it has long since disappeared. If anyone has incite into the reason the show never made it to vinyl, I'd love to hear about it. Who knows, perhaps it is in a vault somewhere and will one day get released. Oh, I could barely talk for two days I was so moved!